Studies in Comparative Religion was founded in Britain in 1963 by Francis Clive-Ross (1921–1981) and is the first and most comprehensive English-language journal of traditional studies. The journal was published under the name Tomorrow until 1967, when it was changed to its present name. Four quarterly issues per year, containing over 1,200 articles in total, were published during the first 25 years of Studies in Comparative Religion’s existence, before its publication was interrupted in 1987. William Stoddart served as the assistant editor for most of these years. Studies in Comparative Religion is devoted to the exposition of the teachings, spiritual methods, symbolism, and other facets of the religious traditions of the world, together with the traditional arts and sciences which have sprung from those religions. It is not sectarian and, inasmuch as it is not tied to the interests of any particular religious group, it is free to lay stress on the common spirit underlying the various religious forms. One of our primary aims is to meet the need for accurate information created by the now world-wide interest in the question of “ecumenical relations” between the great religions, by providing a forum where writers of proven authority can exchange views on various aspects of religious life, doctrinal, historical, artistic and mystical, not forgetting the element of personal experience and reminiscence. By collecting accurate information about the great religions under their many aspects and rendering them available to interested readers we feel we are fulfilling a very pressing need of our time and also contributing in a practical manner to the cause of inter-religious understanding. If there is to be an effective measure of this understanding at any level this can only be on the basis of accurate presentation both of teachings and facts. An ill-informed benevolence is no substitute for genuine insight, based on information that is neither willfully distorted nor confined to the surface of things. In this manner we think that we are best serving the interest of our readers in their search for truth. One of the most interesting intellectual developments of the 1960s was the publication in England of a periodical called Studies in Comparative Religion. When it first came across my desk, it had seemed to me merely another gray scholarly journal—an impression that was only strengthened by its stated purpose of presenting essays concerning “traditional studies.” Like many Americans, I was put off by the very word “tradition.” But I pressed on because I had heard that this journal contained some of the most serious thinking of the twentieth century. Readers of this volume will certainly find in the writings of Schuon and those he has influenced completely new perspectives in every aspect of religious thought…. Very probably, it will seem to the reader that until now he has ignored an entire dimension in his thinking about tradition. That these writings bring something that has been entirely lacking in Western religious thought is therefore not open to question. But that is not the court at which their work deserves to be judged, nor would they wish it so. Something much more serious is at stake than merely renewing the comparative study of religion throughout the land…. The Sword of Gnosis identified a particular group of authors on tradition, bringing together for the first time—for North American readers—the writings of what in academic circles were soon to become known as “Traditionalists” or “Perennialists”. The Sword of Gnosis was reprinted by Penguin numerous times throughout the 1970s, ’80s, and early ’90s and a newly revised edition of the book is forthcoming by Fons Vitae. In due course, this book stimulated a much larger debate in American academia about the merits of the Traditionalist point of view, including the ideas of the Perennial Philosophy and the “transcendent unity of religions”. This intellectual current of thought eventually became known as the “Traditionalist School” or the “Perennialist School”. “Commemorative Annual Editions” for each of the first 25 years of Studies in Comparative Religion will be republished as proofreading is completed. Each Commemorative Annual Edition will contain all of the articles, editorials, and letters to the editor in the exact manner as the four quarterly issues that were published in the respective years. These commemorative editions are available for purchase on Amazon.com, and the World Wisdom Internet site. 2007 marks the start of the 26th year for Studies in Comparative Religion, which is now located in Bloomington, Indiana and sponsored by World Wisdom. The overall goals of the journal remain as they were originally stated more than forty years ago by F. Clive-Ross. This second phase includes both an on-line and a paper journal. A free on-line archive of all the issues of Studies in Comparative Religion dating back to 1963. All of the more than 1,200 existing articles have been scanned but proofreading is not yet complete for all of the articles. Additional articles will be posted on-line as the proofreading is completed. Database search functions by subject or author. The “key word” search engine is powered by Google, thus allowing detailed key word searches throughout this entire historic archive. “Pop-up definitions” are provided by the Dictionary of Spiritual Terms, which allows the reader to click on highlighted foreign or technical words to obtain short pop-up definitions. Free on-line subscriptions to new issues of the journal. All articles featured on Studies in Comparative Religion.com have been enabled to make use of Answers.com AnswerTips. AnswerTips are small information bubbles that define any word or phrase when it is double-clicked. AnswerTips offers fast facts on 4 million topics provided by Answers.com when one double-clicks on any word, without opening a new browser or following outbound links. AnswerTips deliver instant definitions, explanations and facts including biographies, tech terms, geography etc. Definitions of technical terms contained within articles are provided by DictionaryofSpiritualTerms.com. Any word with an available definition is underlined. Simply click on the underlined word to view a short definition. Click on the “more information” for a longer definition from the main Dictionary of Spiritual Terms website. During its first 25 years, Studies on Comparative Religion had its offices in a wing of the Clive-Ross home in Pates Manor, Bedfont, near London, which dates its origins to the 15th century. 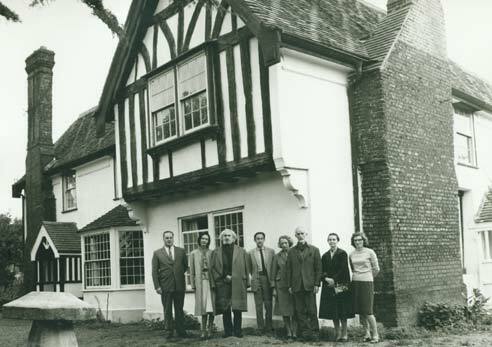 Standing in front Pates Manor are, from left: Francis Clive-Ross, Catherine Schuon, Frithjof Schuon, Martin Lings, Leslie Lings, Whitall Perry, Barbara Perry and Olive Clive-Ross. Photograph c. 1965.